We have decided to officially homeschool our oldest who’s 5-1/2 for kindergarten this year, and continue with preschool at home for our youngest who just turned 4 years old. Over the next few posts, I’ll share with you the curriculum and resources we’ll be using this year, our school room set up, our organization systems, our daily routine, and more! We are in our third week of homeschool already as I wanted to get most of the kinks worked out before sharing! 😉 Today’s post is about the preschool and kindergarten homeschool curriculum we will be using this year! Many of the materials and curriculum we will be using this year are the same for both children. When there is a difference in materials, I’ll specify which is for the kindergartener and which is for the preschooler. I am also admittedly a bit of a curriculum junkie, so I will list the main materials we are using for each subject with a * and then any that we are using as supplements without a *. You most certainly do not need more than one curriculum per subject. 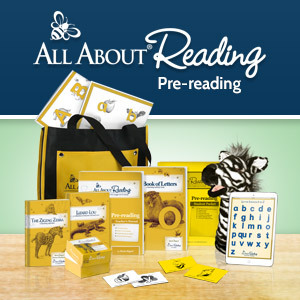 Our curriculum is very heavily reading based, so most of these choices will work well for children who love listening to read alouds. Much of our curriculum is also Christian. Have questions? Feel free to ask them in the comments or on our Facebook page! *Telling God’s Story Year 1 – We are using the instructor’s text for the read aloud portion, and the go-along coloring sheet from the activity book for the kids to color while listening. First Catechism: Teaching Children Bible Truths and Songs for Saplings Questions with Answers CD series – We are reading 2 new questions each week and listening to the accompanying songs to help us learn and memorize them. Sing a Song of Poetry Grade 1 by Fountas & Pinnell – I copy a poem for each child, I read aloud, and then children illustrate the poem and add it to their poetry notebook. *Saxon Math 1 – using this with both kids. Got Saxon K and completed the first few lessons, but it was moving too slow and the kids already knew the material, so we skipped ahead to level 1. Saxon K would be good for preschool if you haven’t done much calendar or math work before, but if the child already has a good concept of counting and 1-10, then I’d start with Saxon 1. Keep in mind we do not use all these materials every day or even every week! Our main focus each day is on Bible, reading, writing, and math, and we also do a lot of learning without using any curriculum at all! I will talk more about our daily routines and weekly schedules in upcoming posts! Are you homeschooling this year? What ages? What curriculum are you using? Wow, super impressed with your curriculum choices, planning and organization. You make me feel like such a slacker! I’m lucky to have a reading and math curriculum for my preK and K. Other then that it we are doing FIAR. I will have to check out some of the books you are using! Thanks for sharing 🙂 My little one will be going into Kindergarten next year and I’m already looking into getting into a set curriculum with her. These are great, checking them out! What wonderful resources! I pinned this post! This was an awesome post! I’m starting pre-k with my daughter next week and have spent days trying to figure out what to do for a specific Bible time, aside from devotions. I was going to start piecing my own together but that curriculum looks awesome! Thanks for sharing! This looks like a great line up. Thank you for the book recommendation, 201 Awesome, Magical, Bizarre, and Incredible Experiments! We are going to be amping up our science this year. We just completed our very first week of homeschool and I’m happy to say we all survived!! Even better, it looks promising that we’ll survive the whole year. I have two girls, ages 7 & 4. For second grade we are using Sonlight along with Abeka for math and for pre-K I am totally winging it. I also purchased Home Art Studio for 1st grade and am hoping it’s as fun as it appears. And we are learning Spanish through La Clase Divertida. Such a thorough list. Thank you for sharing! My wee one will be starting Kindergarten at home next year. I too am a Teacher who has decided to teach my own. I look forward to hearing more about your homeschooling day! Wow! This is an epic post. Genny, very well done. Great plan Genny.Thanks for sharing.May I use this to prepare my own plan?